Home» Fast Offer Now » How to sell a house with lot of problems? We would like to address the most important question ‘’Will my house with a lot of problem sell?’’ with a positive answer- a big YES. Will my house with problems sell? Never underestimate your house, your bad could be someone else’s dream house. So don’t dampen your spirit and sell your ugly house NOW. Selling a house, to many, sounds like a daunting task. Selling a house with problems sounds like mission impossible. Many of us tend to live in inherited house or tend to buy houses that were initially priced low because of its bad condition. As time goes by the condition of the house gets from bad to worse. This article will help you with a few tips that will help you sell a house with many problems. There could be many reasons behind the current state of the house. •	Inherited house – people live in inherited house, house built decades ago by their ancestors but now starting to break down. •	Buying old houses– old houses are often low priced and easily available without much hassle. People looking to buy budgeted homes tend to settle for these old houses without realising the future trouble. •	Natural factors– factors such as heavy rains or sand storms could do a lot of damage to the property. These natural factors play a pivotal role in destruction of a well-built property. How do I sell my house with problems? These are a few quick tips that will help you sell your house with a lot of problems quickly. Repair your old house– to make your house in a saleable condition, you need to take care of the small fixes. Never leave small repairs unattended. If you leave them unattended today, they may cause hindrance tomorrow. Repairing and restoring– Hire a professional to repair and restore your house to please the buyer. If you keep your house in a depleted condition then it might not appeal the buyer. Cleaning and beautifying – Hire a professional to clean and beautify your house. A well maintained house has many takers. Photograph your house– hire a professional to click pictures of the house and make it look like a big deal. A well taken photograph uploaded on web gives a better idea to the buyer of what he is getting into. •First impressions matters a lot – In this business first impressions are the most impactful. If you have a shabby garden and a house that looks ugly, you need to ensure that you make it look presentable. Just like how we judge a dish by the way it’s presented, we have to create a positive impact on the buyer. •Be transparent– Always be fair and transparent about the details pertaining to your property. No attempts should be made to misguide the buyer. Business done on unfair grounds never turn fruitful. •Watch your price– always keep in mind that the house that you are putting up for sale is of no good condition, one needs to consider tis factor while quoting the house. Always watch your price and quote the property. •The last call– if all the above measures look like they will burn a hole in your pocket and you can’t afford it, then you need to help yourself with these two available options. DIY- Do it Yourself. Instead of hiring a professional to do your business, you need to do all the above stated by yourself. You can use s helping hand of a family member of a friend. Sell your home as it is– we live in an internet driven world where many real estate companies buy homes online. They not just buy it online, they also buy it as it is without any repairs whatsoever. 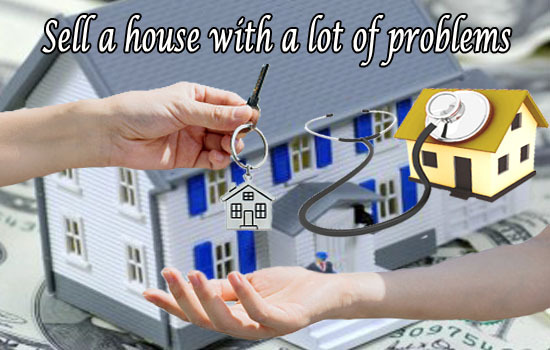 By adopting these quick tips you will be able to sell your house with a lot of problems quickly. Get selling. Your house is worth it. Sell a house to many sounds like a daunting task, selling a house with problems sounds like mission impossible.